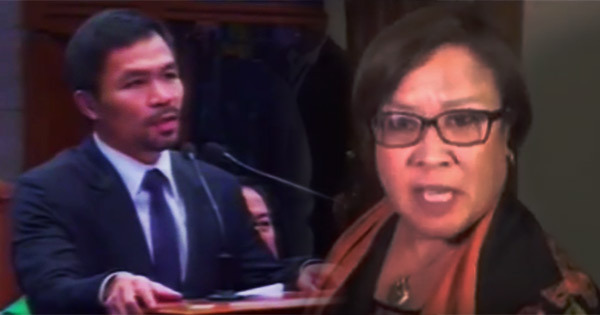 A "knock out" was how netizens described Senator Manny Pacquiao's motion to oust Sen. Leila De Lima as Senate justice committee chair. Following the speech of Sen. Alan Peter Cayetano and after the walkout of De Lima, the boxing icon-turned lawmaker on Monday moved to declare the chairmanship and membership of the Senate Committee on Justice and Human Rights, which De Lima chairs, vacant. Senate Pro Tempore Franklin Drilon, an ally of De Lima, objected to Pacquiao's motion, which prompted Senate President Koko Pimentel to suspend the session to pave way for a caucus. After which the chamber put the motion to a vote. Four senators voted against Pacquiao's motion: Drilon and his fellow Liberal Party members Senators Bam Aquino and Kiko Pangilinan as well as Sen. Risa Hontiveros, a member of the Akbayan partylist group who ran under the LP slate during the May 2016 elections. Two senators abstained while 16 senators voted in favor of Pacquiao's motion. Senate Majority Leader Tito Sotto moved to elect Sen. Richard Gordon to replace De Lima as head of the committee. Senator Ping Lacson was elected as vice chairman while senators Pacquiao, Pangilinan, Migz Zubiri, Grace Poe, Alan Peter Cayetano and (surprise!) De Lima were elected as members.